The Vision Module delivers a dynamic, powerful, and beautiful HMI experience unlike any other. Display real-time and historical data on everything from status-and-control screens to interactive charts and tables so you can analyze data at-a-glance and quickly act on it. Since all clients are connected to a central server, everyone in your company will stay up-to-date and can easily access the real-time data they need. Limited edition: Limited to five (5) HMI/SCADA visualization clients. Unlimited edition: Unlimited HMI/SCADA visualization clients. Ignition’s real-time status and control functionality, coupled with advanced analytic capabilities provided by Ignition’s SQL database integration, gives you the power to quickly analyze and easily display the status of your facility. Set up real-time alarms so your operations team can respond quickly to resolve the issue, either in the facility or out in the field via the Ignition Mobile Module. Set up alarm notifications to be sent by email or text, so you know what’s happening no matter where you are. The included charts, tables, and graphs are customizable and they display your real-time and historical data, making at-a-glance analysis easy. You’ll be able to quickly set up executive dashboards, track key performance indicators (KPIs), and view trends. Easily integrate data from SQL databases with your SCADA system. Data entered by operators can be written directly to any database. The powerful property-binding system makes it easy to display information from databases on any screen. Clients are configured through the included Ignition Designer. Drag-and-drop configuration makes screen development intuitive; simply drag tags and drop them onto components to instantly bind data to objects, tables, charts, graphs and more. Create distinctive screen designs and layouts with shape-building tools for lines, polygons, rectangles, arrows, and circles. Vector graphics let you create precision shapes and Bézier curves that look great on any size monitor; shapes scale to any size without losing image quality. Dynamic positioning lets you bind shape properties to data values so you can easily create animations. Quickly put together great-looking screens by importing any SVG file and using the nearly 4,000 ready-made images available with the Symbol Factory Module. You can manipulate and animate imported vector graphics just like any other object. Develop large projects at record speeds by using component templates. Instances of each template can be placed on as many screens as you want. Any changes made to the template are automatically updated to any instance of that component, saving a huge amount of tedious development time. Advanced functionality can be achieved using the built-in Python scripting engine. Python is an extremely popular, powerful, and easy-to-learn scripting language. Python is highly regarded for its readability, making your projects easy to maintain. 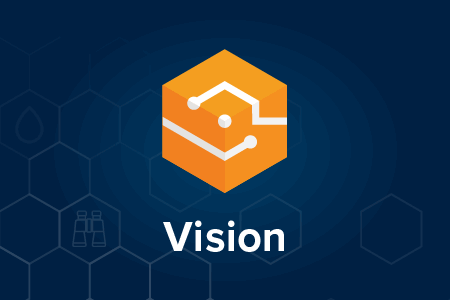 Every client you launch from the Vision Module is secured using SSL protocols. In order to keep your data secure, authentication groups can be used to strictly limit access to certain areas of a project to only the users with appropriate access levels. With the unlimited edition of the Ignition Vision Module installed on your server, you can launch as many clients as you want, instantly. No individual client install required! With Ignition, managing five clients is just as easy as managing 50. All clients can be updated instantly by making changes to the master project screen on your server, and then clicking the update button. View your HMI/SCADA system from anywhere, any time, on any machine. Ignition uses your machine’s web browser to launch rich Java applications – not thin web pages – which are fast and cross-platform, making accessibility easy for anyone on your network.